Are they truffles? Are they cake balls? Actually, they're both! These indulgent candies have a soft truffle center surrounded by a rich chocolate cake mixture. They're finished with a dunking in more chocolate, to make them the perfect portable, pop-able dessert! Just as classic lava cakes are filled with a gooey chocolate mixture that flows when warm, the truffle inside these candies stays deliciously soft, and although it doesn't quite flow like lava, it does provide the perfect contrast to the cake and the crisp chocolate shell. Don't miss the photo tutorial showing how to make cake truffles, which uses many of the same techniques these truffles require. 1. Prepare the ganache first. Place the chopped chocolate in a medium bowl, and pour the heavy cream into a small saucepan. 2. Heat the cream over medium-high heat, and bring it just to a boil. Pour the hot cream over the chopped chocolate and let it sit for one minute to soften the chocolate. After one minute, gently whisk the cream and chocolate together until the mixture is smooth and shiny. Press a layer of cling wrap on top of the chocolate and refrigerate it until it is firm enough to scoop, about 90 minutes. If you want to speed up the process, spread the ganache in a thin layer on a baking sheet, press cling wrap on top, and refrigerate it for 30 minutes. 3. Once the ganache is firm, roll it into small balls the size of a dime, and place them on a waxed paper-lined baking sheet. You should get about 36 balls. Return the balls to the refrigerator to firm up, for about 30 minutes. 4. While you wait for the ganache balls to be firm, prepare the cake mixture. Combine the cake crumbs with 1/2 cup of chocolate frosting, and mix everything together with your hands, working the frosting into the crumbs evenly until you have a moist mixture that holds together when you press it into a ball. Depending on how moist your cake was originally, and your personal preference, you may want to add up to an additional 1/4 cup of frosting until you get a texture that is easy to work with but is not gummy or soggy. 5. When the ganache centers are firm, it's time to assemble the truffles. Take a 1-inch ball of cake mixture and press a ganache ball into the center. Roll it between your palms to make it round, then replace it on the baking sheet. 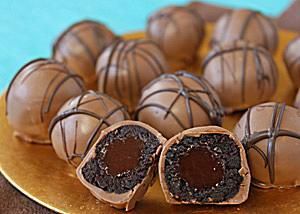 Repeat the process of inserting ganache balls into cake balls until all of the truffles are assembled. Return the tray to the refrigerator until the cake truffles are firm enough to dip, about 30 minutes. 6. Melt the milk chocolate candy coating until it is smooth and fluid. Using dipping tools or a fork, dip a cake ball into the candy coating, and once it is fully coated, replace it on the baking sheet. Repeat until all of the truffles are dipped. 7. If you're using the dark chocolate coating as decoration, melt it in the microwave. Pour it into a plastic bag and snip off a corner. Drizzle the chocolate decoratively over the truffles. Let the coating set completely. 8. Store Lava Cake Truffles in an airtight container in the refrigerator for up to two weeks. These truffles should be served at room temperature, so the ganache inside is soft and smooth. Click Here to View All Cake Candy Recipes!